For the restraint and control of guard dogs. 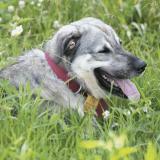 To allow guard dogs to pull a drag more comfortably. 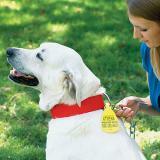 To carry identification neck tags. Twice as wide (2" vs 1"). 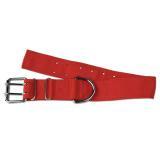 Less risk of the collar chafing the hair and skin from pulling drags and chains. 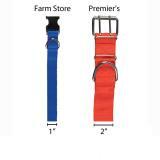 Extra-large D loop to take the strain of large strong dogs pulling a drag on it 24/7 without wearing out the loop. 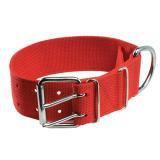 Extra-large, strong, secure buckles to reduce the risk of failure. 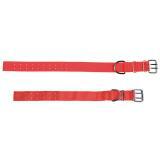 Bright red color for maximum visibility to strangers and hunters. Made of a soft but tough material that’s kind to both dog and dog owners. Don't let the low cost fool you. Normally, prices this much lower suggests the item must be inferior. Please trust us. They aren't. In fact they're equal to or better. Fantastic quality, fantastic value. 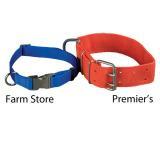 Couldn't find a comperable collar in any store, and the inferior one's we could find would have been more expensive. Easily fits our LGD Great Pyrenees. Thanks Premier One for offering a great product. 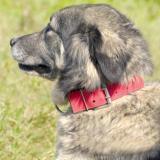 I unfortunately was very disappointed in this collar in that it was too short to fit my LGD. 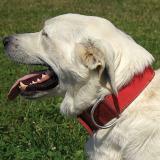 He's an 18 month old Great Pyrenees/Anatolian Shepherd cross, right at 100 lbs, so certainly not large by LGD standards. The collar was too tight on the last holes and definitely would not fit him at all as he continues to grow and fill out. While the collar appears to be very well made and I sure wish it would fit, I have to give it only one star as it's basically unusable for my LGD. No, I didn't measure my dog's neck before I bought the collar, which is the advertised 25" length, however, I expected a collar marketed for LGD to actually be large enough to fit my average sized dog. 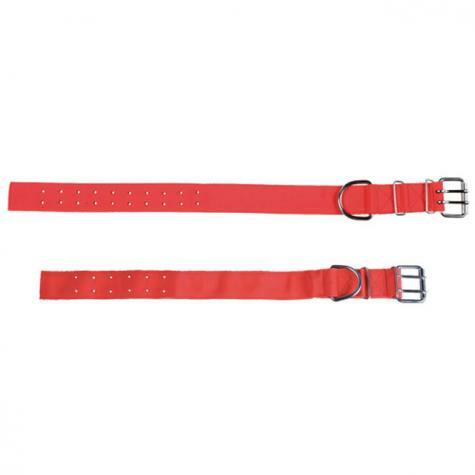 If you are thinking about buying this collar, I would recommend you measure your dog's neck first just to be sure it's a few inches smaller than 25. If it does, I'm sure you'll be very happy with it. If it doesn't, don't bother buying. I bought 2 collars. They are perfect for our Great Pryenees. We had a problem putting their rabies tags on as the "S" hook was not big enough. We solved that problem by using a key ring to hold the tags. Bought 3 for my livestock guardians. They are just as advertised - thick, beefy, heaviest hardware I've seen. Excellent.